Abraham allows his nephew, Lot, to choose the land he wants. It seems to me that good community can happen anywhere. It used to be very common in close-knit ethnic urban areas. Jews, Irish, Germans, Poles, and so forth lived in distinct communities with a culture all their own (often these people had large gardens and were, for all practical purposes, agrarians). I’m sure that is still the case in some urban areas. Good community can and should also happen within churches. Indeed, within the ethnic urban neighborhoods I mentioned, there was almost always a nearby church that was central to the life of the community. Good community also happens within fraternal organizations, and other kinds of groups where like-minded people regularly gather. Those examples are, to my way of thinking, examples of good community. But they are not examples of the very best to be found in the realms of community. Those of us who are seeking to more closely embrace the ideals of Christian agrarianism, understand from God’s Word that the fellowship of Christian community is essential to the Christian life. And, beyond that, we know that we are called to be a witness for Christ with the life we live in the more-worldly community outside our church community. But we Christian agrarians are also inclined to think that community lived within the agrarian paradigm (as opposed to an urban or metropolitan setting) is also more Biblical and more preferrable. Cities and urban areas are, and have, throughout history, almost without exception, been centers of human pride and rebellion against God. Such places are suited to be mission fields but I seriously question if such places are best suited to raise Christian families (and families are the backbone of a thriving Christian-agrarian community). Unfortunately, as is sometimes the case, the wisdom of godly fathers is not accepted by the children. It wasn’t long before some of Noah’s descendants left the agrarian life and assembled in cities. Most notable among these descendants was Noah’s great, great grandson, Nimrod. He formed the first great empire after the flood. It was centered around several cities in the land of Shinar, which was in the “fertile crescent” of Mesopotamia. The head of Nimrod’s empire was the city of Babylon. It was not a godly city. In Genesis 11 we find some interesting happenings in the land of Shinar. The descendants of Noah said, "Let us build us a city and a tower, whose top may reach unto heaven, and let us make us a name, lest we be scattered abroad upon the face of the whole earth." Well, God was not happy with these people and their city. Spreading out abroad upon the face of the earth was exactly what He wanted them to be doing. In other words, He wanted them to live a decentralized, rural existence. But they were determined to do just the opposite. Whenever and wherever rebellious mankind congregates, they want to build monuments to their own greatness. So they worked together to "build a tower, whose top may reach unto heaven." We all know the rest of the story. God "confounded their language." They could not communicate and were forced to give up their plan. Foolish creatures! But wait a minute.... Is the industrialized culture we now live in much different from Babylon? I think not. In fact, I dare say the ungodly corporate-industrial civilization we live in, working out of the major cities and urban centers of the world, taking upon itself the attributes of God, is exalting itself above God more than Nimrod and his tower of Babel ever did. Curiously, this prideful expansion and exhibition of man’s sovereignty has been facilitated largely by the inexorable and amazing expansion of communication technology. It is through various forms of attention-grabbing modern communication that the worst of city culture is now communicated to the masses, even into the rural heartland of America. That’s something to think about, but I digress. 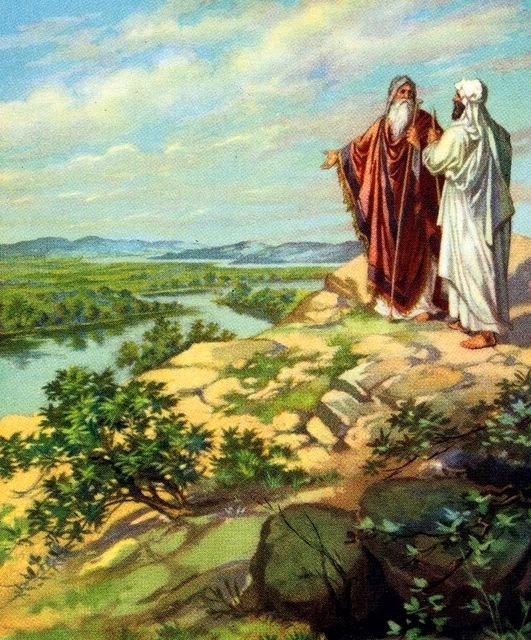 A little farther ahead in history we find Abraham and his nephew, Lot, looking over the plain of Jordan. Abraham tells Lot to choose the right hand or the left hand to dwell in. Whatever is left, Abraham would be content to dwell in. What part does Lot take? He takes the part with the best water and the richest soil. It also has cities. Then Abraham goes and lives his agrarian life while Lot goes and pitches his tent toward the city of Sodom. Before long, Lot is seated in the gates of Sodom, which I understand to mean he was one of the leaders of the city. It appears that it was not so much the good land of the plain that appealed to Lot as much as the cities that were in the plain. Wicked cities. What is the final outcome? The cities of Sodom and Gomorra are justly destroyed. Lot, along with his wife and daughters, are rescued by angels. Mrs.Lot, so in love with her urban life, looks back and is turned into a pillar of salt. Lot’s two daughters don’t turn to salt, but it appears from their actions afterwards that they were heavily influenced by the ungodly city culture. Lot, a godly man by every account, made a foolish decision to leave the simple life of an agrarian herdsman and brought his family into the more "exciting" city. I suspect there were more "opportunities" there, more things to do, better entertainment. One can easily justify urban life on such grounds. But it was flat out wrong for Lot’s family to get involved in the culture of the city. That’s the way I read it. And I don’t think much has changed since then. "The ancient walled city of the Bible had the most in common with the modern city. It was most often a center of apostasy, a base for imperialism, a treasure trove for plundering tyrants, a monument to human pride, vainglory and rebellion against God... The city provides no ideal for culture since it is opposed to biblical culture. Like Babel, the prototype, it has been erected in defiance of God’s design for a decentralized agrarian civilization." The point is, good community can be found in a lot of places but the very best in community experiences, the kind of community experiences that are best for raising a family for the glory of God are, I believe, found within agrarian settings. Having said that, I’d like to give you five primary ingredients that are found in the best community experiences. They are: Time, Place, Proximity, Mutual Concerns, and Mutual Kindness. By time, I mean years. The more the better. Generations are best. By place, I mean a home where a family lives, on a section of land that the family has, over time (maybe even generations) cared for and grown to love. Proximity is the state or quality of being near. A new kind of community has emerged in recent years with the advent of the internet. Such a community can be good. But it can never be a best form of community because there is little proximity. Virtual proximity just isn’t the same as physical proximity and never will be. Mutual concerns arise out of a mutual worldview. Worldview boils down to fundamental ideas about what is right and wrong, good and bad. Worldview is at the root of religious belief. Generally speaking, rural folks share similar belief systems. They may not all agree on religious doctrines but they think alike on many core issues. One example of this becomes clear during a national election when the rural areas of the nation typically vote the same (i.e., the “red states”). Mutual kindness is when people in the community interact by speaking, visiting, working, caring, sharing, and giving to each other in some way, to some degree, preferably on a daily basis. This kind of best community was once the norm in most rural areas of America. It was also found in small rural towns and villages. But as agrarian culture has given way to modern, industrialized culture, the social fabric of rural communities has become more and more threadbare. That being the case, those of us who call ourselves Christian agrarians are looking to find and help reweave the beautiful fabric of rural community. We want to raise our families, put down generational roots, be good neighbors, be salt and light. Instead of living “part time” in a community while driving to the city to a job every day, we dream of actually working full time at or nearer our homes, where we can be a more integral part of the comunity. I believe there are Christian families searching for the ideal community—one in which all those qualities I’ve mentioned work together flawlessly. Of course, such a community doesn’t exist. I’m sure, though, that some areas of rural America experience better community than others. Perhaps among the close-knit Amish and Mennonite sects you will find the best examples of agrarian community. Whatever the case, each family’s search for Christian-agrarian community will take them on a different journey. For myself, for now, I believe the best community I can find is right where I am. I have lived in this rural area of central New York State since 1973. Unfortunately, this place is no longer as rural as it was 33 years ago. It isn’t so much that more people have moved into the area (there is plenty of room for more people in rural America), it’s that more people with urban ideas have moved in and, sadly, there are far less real farmers. The price of land has climbed (always just out of reach for me) and New York State property taxes are criminally high. Sometimes I think of moving to another state like Tennessee or Missouri or Kentucky. Maybe someday I will. But I probably will not. This is a beautiful area. And after so many years I’ve come to realize that I have become part of this community. I know so many people. I actually know (and like) my neighbors. We attend a nice country church. The experience of rural community that so many people in America do not know, and so many are searching for, can be found right where I am. I suspect it can be found in most any rural area. It won’t be perfect. But you can make it better. In closing, I guess I would say to aspiring Christian agrarians, those who are looking for a place to live and put down roots. Find an area of the country that appeals to you and find a small, rural, Bible-believing community church to attend and get involved with. Probably the church where the old local farmers go would be a good place. You’ll find “salt of the earth” people there. You’ll find community there. From my own personal experience reading this post has said it better than I could ever write it. I also wondered where a person could go to find community, where on earth could we go. Only to find it right at home in a small rural church. Maybe I should settle down and write our experiences we've had here. I sit back in awe how God works. Yes, I will write about it soon. The one sentence that is key in your post;......or should I say two sentences....."It won't be perfect. But you can make it better." This is what's happening here. Now days what is posted on these blogs is acually being preached from the pulpit in our little church. Many are homeschooling and plus we are starting a Bible based private school much to the dismay of many local folks and churches. Good food as God intended us to eat is being preached. Farms are being blessed, and even our assosiate pastor has bought a very small farm and is starting homesteading. Small town folks in our church are starting to put in gardens again, raise a few chickens, maybe a couple of hogs. Back to what I called your key sentences, it takes a spark and when that fire's lit it can really take off! Thank you for such a thought provoking post! I recall reading in somewhere that essentially there was a cultural war fought in the 20's and 30's between the "rural culture" and the "New York City culture." The "New York City" culture won out out and supplanted the rural culture. Compare that to the "Better Housekeeping" you see on the grocery store racks. My wife recalls reading them when she was a child to learn cooking and sewing. She won't touch them now. "Better Housekeeping" has become too scandalous for her. The city culture is everywhere now. Your assertion that the Christian-Agrarian lifestyle is the "very best" form of communty seems judgemental. The Lord calls all people to his kingdom regardless of their status in this brief lifetime. All have the ability to serve or deny God, wheather it be in the Christian-Agrarian setting or the inner city. There are many in this world, raising families in a deplorable area in comparison to what you describe and are no less children of God, striving to do their best. people do not disagree with the things I post here. made, it causes me to take a closer look at exactly what I said, and that’s always a good thing. indeed correct. My assertion is judgmental. judgments about what is right, wrong, good, better, and even best. Then, hopefully, we will live our lives according to what we believe to be best. If by “judgmental,” you feel I have said that Christian agrarianism, lived in a rural community, is the only way to come to God, or know Him, be in His will, or live a life that glorifies Him, then you have seriously misunderstood me. I never said that. I hope I would never say that. That would be terribly wrong. I agree with that statement. 100 percent. I agree with that statement too. 100 percent. I could not agree more! Lot lost his family to the ungodly culture of Sodom when he brought them to live within it. Things would have been a whole lot better if they had stayed away from the city culture and lived the simple rural life, like the much wiser Abraham. All beliefs are, when you think about it, judgmental. That said, I’ve come to believe Christians are called to separate themselves and their families from the ungodly, worldly culture around us—a culture that is firmly rooted in, and fed by, prideful industrialism and urbanism. I could be wrong in that belief. But it seems painfully obvious to me. nurture a family, to build a strong, lasting and vibrant Christian culture (an alternative to the ungodly urbanized culture) is within a rural environment, close to the earth, close to fellow believers, in community. indirectly, in the months ahead. (perhaps many) will not see it. Or they will outright reject it. I have no control over the outcome. All I can do is testify to what I believe to be true. Oh, one more thing, while I’m thinking about it.... I want to make clear that I believe it’s possible to be a Christian agrarian in the city or suburbs. There are plenty of Christian agrarians who live in such areas. But the fullest expression of Christian agrarian belief is found within a rural setting, in rural community. Thank you for your courteous clarification. I agree, we should live our lives in accordance with what we "judge" to be the best choices for our individual situations. This of course guided by our relationship with our Heavenly Father. Several of your postings speak of the present worldly condition and I believe that it has been brought about by people making choices and determining action based on their own selfishness, rejecting God and His natural order. I would be interested in your thoughts on "city-agrarianism"
I respect your post, but I didn't believe agrarianism are a good choice in developing countries (esp. Emerging markets like Indonesia).